If you’ve been reading these little journal entries of mine for a while, then you already know every time I travel with my husband I seek out a memorable lunch (like this one in Ponza). However, this is not a post about an elegant restaurant with a fancy wine list. And there are definitely no white tablecloths! This is simply a post about the most wonderfully simple lunch, with a view that will make you weak in the knees. You see, we were recently in the North West of Sicily in the tiny fishing village of Scopello (about an hour from Palermo airport). And there was only one place I wanted to have lunch and spend the Saturday afternoon: the Tonnara, a 13th-century tuna fishery. It's a secluded gem with a beach club vibe (although there is no sand) and deck chairs, surrounded by the Faraglioni rock formations, which are reminiscent of Capri. But before you start expecting La Fontelina (Capri's famous beach club), you need to know that the Tonnara does not have a restaurant or even a cafe. Only a vending machine, which means an afternoon spent here requires some planning. Before you get put off by it, remember, the views are breathtaking. And it just so happens that Scopello is an excellent spot to source picnic supplies. We decided to stick with local flavours and stocked up on delicious smoked tuna sandwiches made in front of us by Pepe at Alimentari di Scopello. There are plenty of sandwich bars in Scopello and Panificio di Stabile e Anselmo is another popular option. We completed our picnic with a large bottle of water and a packet of my beloved Italian crisps...Fonzies. I'm sure you are familiar with the iconic red and yellow packaging! See, I warned you that this wasn't a post about a fancy restaurant! To our delight, Alimentari di Scopello was very well placed for finding the pedestrian shortcut down to the Tonnara. Just follow the little road beyond the Lounge Bar Belvedere until you can go no further. Yes, that flattened grass between the rocks is the opening you’re looking for. This route will save you lots of time and you should be at the Tonnara within 15 minutes. Once you arrive at the Tonnara, you pay the fee to the ticket office and just follow the signs (and people) down the hill. There are deck chairs and large sails offering shade. We walked around to the right and found a peaceful spot with plenty of available seating, which was perfect for our picnic. 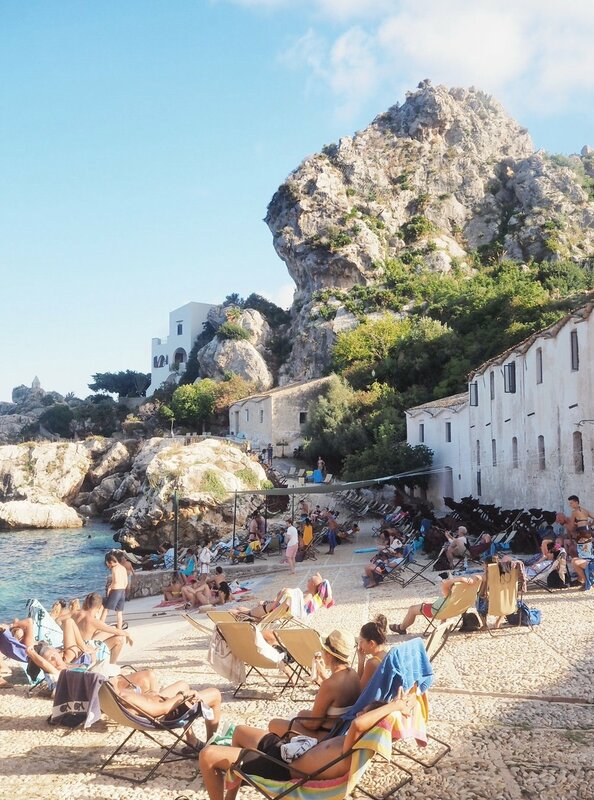 There isn't a single spot within the Tonnara that doesn't benefit from one of the best views you will ever see—deep blue sea, the rocky Sicilian coast, spectacular rock formations and lots of bobbing boats. The clientele is largely Italian and the crowded scene of sunbathers lying on rocks in the middle of the day reminded me of a Slim Aarons photograph. And I’m not the only one who sees the photographic potential as the Tonnara has famously been featured in several movies and TV shows. We pulled out our sandwiches, relaxed and enjoyed the moment. It truly was like a scene from a movie—children diving from the rocks, couples snorkeling and a lot of fancy boats floating nearby. We read our books, shared the Fonzies and spoke of all the things you can only talk about when you are travelling as a couple without your children. That little setting and those incredible sandwiches made for a surprisingly romantic and memorable lunch. The Tonnara is open from 9 am-7 pm and entry costs €5 per person. There is a maximum capacity of around 700, which I suspect is reached fairly early in the day during August. The Tonnara can get very crowded, so I was grateful we were travelling in September, as by 5.00 pm it was pretty quiet and relaxed. If you crave the peaceful bliss of early morning Tonnara and like the sound of exclusive access after hours, then you can stay in one of the beautifully refurbished apartments within the Tonnara complex. As for my husband and I, we settled for a simple afternoon lunch, but the views and experience will not soon be forgotten. Until next time, Sicily!